Infection-control nurse leader, Hilda Diongon, recalls her first days as a nurse in the U.S. and how she’s supporting relief efforts to help the Philippines. A colleague Onelie Martinez, RN in consultation with Diongon. Hilda Diongon recalls the first time she saw HHC’s Jacobi Medical Center in the Bronx, when she arrived in 1983 with a group of young nurses from the Philippines who had been recruited by New York City in the middle of a nursing shortage. She had left behind a husband and two young children, as had many of the hundreds of young women who made the journey to an unknown land in hope of a brighter future. The culture shock was profound. Among other things, Diongon and the other Filipina nurses had to learn to cope with the American hospital system, where nurses are the main caregivers for patients. Back home, family and friends of patients helped provide basic hygiene, for instance, in the hospital setting. And in the days before the Internet and cell phones, calling home meant queuing up for pay phones with a fistful of quarters and sometimes getting cut off mid-sentence as she spoke to her children, who were three and two years old. 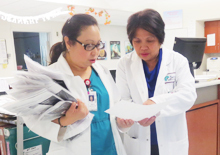 Flash forward 30 years, and now Diongon, 57, is an infection control leader of the award-winning Jacobi Hospital Infection Prevention Department, where she is responsible for making sure doctors, nurses and other staff follow policies and procedures for protecting patient safety. Her team’s efforts helped Jacobi receive an overall grade of A in patient safety by the non-profit watchdog organization, the Leapfrog Group, as well as an award for Outstanding Performance in Patient Safety and Quality from the Northeast Business Group on Health for the third consecutive year. She is also helping to raise funds for relief for victims of the recent devastating typhoon back home in her native Philippines, where hospitals lie in ruins along with people’s homes. At Jacobi, Diongon helps lead special initiatives to ensure hand hygiene among staff as well as reduce catheter-associated urinary tract infections, both of which are HHC-wide efforts at eradicating hospital-acquired infections, an important care marker for federal and state regulators. “We work behind the scenes doing vigilant surveillance and this helps us identify potential contagious illnesses and provide immediate intervention to prevent infections and help save lives,” she says. Sometimes Diongon and the infection-control team reinforce their message by having staff use an ultraviolet black light to illuminate hands and surfaces that were not properly cleaned. “It makes an impression," she says. "She is outstanding," Dr. Christina Coyle, Jacobi's director of infection prevention and Diogon's supervisor, said of the head nurse. "Her attention to detail is superior. Her approach to infection prevention is driven and diligent and as a result, our patients are safer." Diongon also is a member of a thriving Filipino community in her adopted home in the Bronx that is rallying to lend assistance to fellow countrymen who were affected by the damage and destruction of the typhoon, which made landfall in the Philippines in early November. One of the strongest storms ever recorded, the typhoon and its storm surge are estimated to have left more than 5200 persons confirmed dead and thousands more homeless and without basic necessities like food, shelter and medical care. As a member of the Philippine American Association of the Bronx, Diongon recently spent hours with other members of her community collecting funds, clothing and food donations at Our Lady of Solace Roman Catholic church on Morris Park Avenue in the Van Nest neighborhood of the Bronx. She says many Filipino HHC employees, including her, have family whose homes were damaged or totally destroyed in the storm. Diongon’s immediate family have long been reunited and her family back home are safe. Her husband, son and daughter came to the U.S. after seven years apart; another adult son was born here. Through the association, she’s hoping to raise $10,000 in aid for storm victims, she said. More than $1,500 has been raised so far. The group plans to pack donated goods the weekend before Thanksgiving, also at the church. “Last week a guy gave us four suitcases of clothes and kids helped pack them,” Diongon said. Meanwhile, HHC President and CEO Alan Aviles also announced that The Fund for HHC is soliciting donations for relief of typhoon victims, as it has for other natural disasters, at The Fund for HHC/Philippines Relief, 346 Broadway, Suite 715, New York, NY 10013, ATTN: Angela Lyles. Checks and money orders should be made out to Direct Relief or Doctors Without Borders.